story by Ariela RosePhiladelphia, as the old trope goes, is a city of neighborhoods. While each has its own concerns and culture, sustainability is a key for all in establishing and maintaining a neighborhood that nurtures and uplifts those who live there. In our Sustainable Communities in Action series, GRID will highlight organizations that are working to make their neighborhoods greener, safer places that residents can feel proud of. Residents of the east kensington, Fishtown and Port Richmond areas of the city are served by Sustainable 19125, an innovative community partnership created by the New Kensington Community Development Corp. (NKCDC) to address sustainability issues and quality-of-life concerns. The initiative’s goal is equal parts community revitalization, greening and neighbor-to-neighbor camaraderie. “Sustainability is all about social equity and economic equity, and we thought that there was a way to try and shape a new program in a way that we could address all of these things,” says Shanta Schachter, deputy director at the NKCDC. Sustainable 19125 was launched in 2009, the result of a collaboration among NKCDC, the Office of Housing and Community Development and the Pennsylvania Horticultural Society (PHS) designed to revitalize the community’s 1,100 vacant lots. While efforts to plant gardens and paint murals in trash-filled lots were aesthetically beneficial, residents desired more. Concerns over perceived divides between new and old community members, safety and the neighborhood’s carbon footprint were all instrumental in establishing 19125’s plan of action. To get the ball rolling, the NKCDC gathered partners, and held a kick-off party in January 2009. Community members and local businesses passionate about greening efforts—including Postgreen, Greensgrow Farm and Johnny Brenda’s—were in attendance, and group sessions led to a lengthy wish list of program priorities. “The big ones that came out were green infrastructure; that people wanted simple and easily actionable things that they could do in their own homes; that people wanted education; and that people wanted to build off of existing assets,” says Schachter. Those existing assets include the Market-Frankford elevated train line and plenty of open space. The combination led to the creation of the Big Green Block, a $45 million green infrastructure oasis between Front Street and Frankford Avenue, and Norris and Palmer streets. The block boasts the country’s first LEED Platinum High School (the New Kensington High School for the Creative and Performing Arts), a plethora of stormwater management tools, educational murals and green beautification efforts galore. As a result, the Water Department is now able to collect 90 percent of stormwater runoff in the area, and ridership to one of the city’s least-used transit stops, the Market-Frankford’s Berks station, has increased. In Phase II of the block, planned to be implemented in the spring of 2012, Sustainable 19125 hopes to add stormwater gardens at the streets’ intersections. Importantly, Sustainable 19125 is not focused solely on creating glistening green infrastructure projects. The program is perhaps better known for the grassroots community efforts run by residents themselves. 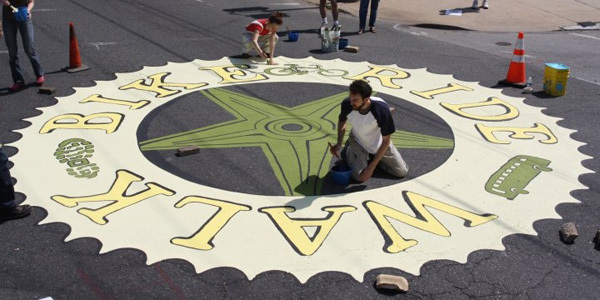 It is through community campaigns that programs like Walk, Bike, Ride, a car-free transportation campaign, and Green Blocks have come to fruition. Green Blocks is the most far-reaching of the community initiative’s programming efforts. Activities and workshops are divided into themes that include greening, recycling, energy, water conservation and buy local, grow local. All are focused on at-home actions that residents can take to reduce their carbon footprints, and run the gamut from free giveaways of recycling bins and compact fluorescent light bulbs, to rain-barrel, composting and gardening workshops. Specially selected residents serve as Green Guides on their blocks to further assist with conservation efforts. Both Schachter and Reese beam like proud parents as they discuss Green Guides, who have gone above and beyond their call of duty. One woman spearheaded a compost program with Philly Compost and was able to score the community a self-contained composting unit known as an Earth Tub. Another resident hosts monthly block parties where she and her fellow Cumberland Street dwellers sport “Cumbies for Life” T-shirts, and balance beer-imbibing and socializing with white-roof workdays and presentations from PECO representatives on reducing energy use. For more information on Sustainable 19125, visit the organization’s recently re-launched website at sustainable19125.org/wordpress. And stay tuned for more neighborhood organizations as our Sustainable Community series continues in future issues.